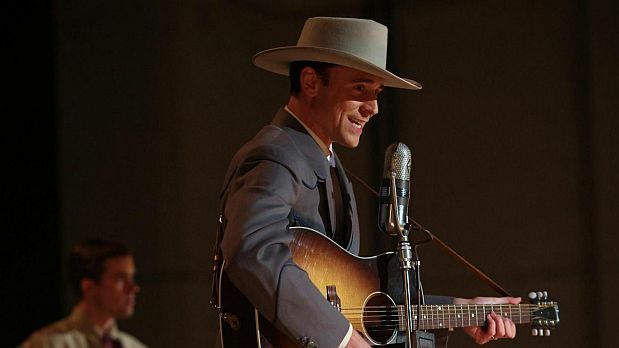 Tom Hiddleston as Hank Williams in Marc Abraham's I Saw the Light. Hank Williams was born in a two-room cabin in Mount Olive, Alabama in 1923. He was an over-active child whose enthusiasm for constant play was subdued by the gift of a guitar at the age of seven. The cheap instrument was from his mother and could be considered a blessing and a curse for the young boy who was one restless soul. Williams took lessons from a black street singer by the name of Teetot who taught him a few blues licks and how to sing. He also learned how to drink and to quell his hyperactive soul with alcohol, in between writing songs. By the time he was 21 years old he had his own band, his own radio show and a growing audience. Hank Williams sang about God, love and loss, and having a good time, which was quite the appeal in post-war America. His sound was a mix of country, swing and the earliest form of rockabilly that appealed to the teens. As a man he was charming but reckless with his health and his two wives. He died young while riding in the back seat of one his prized Cadillacs. It’s the kind of stuff that would make a great movie – unfortunately that movie isn’t I Saw the Light, starring Tom Hiddleston as Williams. I Saw the Light is a film whose focus is so narrow that it fails to understand the man, his songs and how he became one of the most important figures in country music. While it features some great tunes penned by Williams like “You’re Cheatin Heart” (sung very well by Hiddleston), the movie doesn’t help us understand why these songs are important in the history of country music or how they became as famous as the songwriter. Part of the problem could be that the film starts in the middle of Williams’ life. It’s 1944 on a rainy evening in a gas station we meet Williams, earnestly played by Tom Hiddleston (The Night Manager) and his first wife, Audrey, played by Elizabeth Olsen (In Secret). They’ve hired a justice of the peace who marries the couple after confirming her recent divorce. All seems rosy until Williams’ mother Lilly, played by Candy Jones, comes between him and his new bride quite literally on their wedding night. Williams’ mother is also his road manager and gets him out of the marriage bed to drive him from town to town to push his fledgling career. (We don’t really know why she does this) Williams still lives at home stifled by his mother’s demands, her jealousy, and his new wife competing for his attention. In the movie Williams can’t really handle their expectations and gets anxious so he acts out with some nasty behaviour. From this point, the story of Hank Williams, according to director/writer Marc Abraham, is reduced to his constant womanizing, his argumentative relationship with his wife and his drunkenness for the next two hours. In between we get personal anecdotes from Fred Rose (Bradley Whitford), his business agent and publisher, who talks about Williams and his career in music, inserted as a black-and-white newsreel. And while these inserts were meant to flesh out the Williams personality, they underachieve. Next, there’s a scene of Hank and his band recording “Move It On Over” which becomes a radio hit in 1947 and gets him a record deal with MGM in Nashville. Nevertheless, in spite of his success, in yet another scene he fights with Audrey causing her to file for divorce. The truth is Audrey was his manager for years but in this movie she’s written as a forlorn housewife. Elizabeth Olsen and Tom Hiddleston in I Saw the Light. Then, in 1948, a scene of Williams drying out in a hospital for a couple of weeks to make good, and clean up his act. It works because it leads to an offer of a radio show called Louisiana Hayride in Shreveport. But the needy Williams can’t do it without Audrey, so he goes to her house and using his Southern charm, wins her back and heads south. At this point in the story, Williams gets more money and fame and buys a large house and a few Cadillacs. (The movie’s costumers and set designers do a terrific job of showcasing their wealth) Only a guy like Williams would buy his wife a fur coat in the heat of Tennessee. His only moment of joy comes when, after a late night of drinking, Audrey says she’s pregnant with their first child. Cut to a scene of Hank and his band in a restaurant getting word of his wife’s successful delivery of a 10-pound baby boy. Next a scene about Williams’ case of previously undiagnosed spina bifida and his need to ease the pain with morphine, Williams' drug of choice. At one point, Williams is dropping medication as he heads out to a show in Texas. But he can’t do it because he’s so hammered upon arrival he can barely stand. British actor Tom Hiddleston’s performance of the imbalanced artist is worthy, but now, one hour in, his efforts to create empathy for the character are lost. At this point we’re not sure if the fractured motion picture is a metaphor for Williams’ fractured life. On June 11, 1949, as slated in a graphic, Williams makes his debut without an audition on the stage of the Grand Ole Opry. At this point the movie, which could be considered a climax, the elaborate scene falls flat. Suddenly the movie has become a bit of drag rather than a continuous and evolving narrative. The individual scenes are dramatically strong in and of themselves, but there’s little to connect them to the story and its subject. My favourite scene is near the end of the movie when Williams and his girlfriend Bobbie Jett, played nicely by Wrenn Schmidt, are sitting on the end of a lake deck. After she declares that she’s pregnant only to get a selfish response from Williams who can’t handle it, she says “Hank, you are really screwed up” to which he responds, “I know.” The film never gets to the why of his answer. But near the end of the movie, the director Marc Abraham, who also wrote the script, captures the essence of Williams and how he may have seen himself, “Everyone has a little darkness in them. They may not like it. They don't know about it, but it’s there. And I’m talking about things like anger, misery, sorrow, shame. And they hear it. I show it to them. And they don’t have to take it home.” It’s an insightful moment, but the picture fails to take that moment as a defining Hank Williams the man. I consider it a missed opportunity. Just when you think the film will delve into the deeper aspects of its irascible subject, it falls short. The picture ends in 1952 with Williams crawling into the back seat of his Cadillac to be driven to the ill-fated New Year’s Eve show in Ohio. This is followed by a stagy concert performance of the song “I Saw The Light” which has the whole audience singing in grief after learning the news of his death. But its meaning seems trite and uninspired. The best bio-pic about Hank Williams is based on a play, called Hank Williams: The Show He Never Gave (1980) starring the incomparable Sneezy Waters (Peter Hodgson) whose convincing portrayal of Williams has all the humour, pathos and insight that I Saw the Light seeks but does not find. "Only a guy like Williams would buy his wife a fur coat in the heat of Tennessee." Our family lived in Arkansas for several years. We were only 70 miles from Memphis, Tennessee. The winters in Arkansas could get pretty bloody cold, with torrential rain and substantial snowfall.